Sunshine, sandy beaches, and memories that will last a lifetime are all things you will find in this "Reel Paradise". This 2 bedroom, 2 bathroom gulf front unit comfortably sleeps 6, on the 8th floor, making it a great choice for families with children. The master bedroom features a King bed while the guest room has a queen. The additional bunk room with a twin bunks is great for kids! 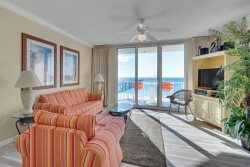 Enjoy the amenities offered in this unit such as a washer & Dryer, WiFi, an upgraded kitchen and the beautiful, breathtaking views of the Gulf of Mexico from your private balcony. If you are ready for some seashells, sunshine, and the beautiful emerald coast, we'll "sea" you soon at Summerwind 803 C! It was a great experience. I am a retired disabled Marine vet and I appreciate the discount you give vets. Truly a great vacation. We will be back. Everyone I talked to on the phone prior to arrival were very knowledgeable and friendly. During check in, the staff were helpful and gave us a lot of information about the property and the surrounding area. The condo we stayed in (SW803C) was comfortable and had an awesome view of the Navarre pier and Gulf. It was very clean and everything was in working order. The pools were well maintained and the gift shop staff were very nice. The property was very clean. The room was cozy and comfortable and the view was amazing! Excellent team members. Always helpful with anything you asked them. Location is great and easy access from interstate Property was well maintained and cleanliness was excellent .Family oriented.